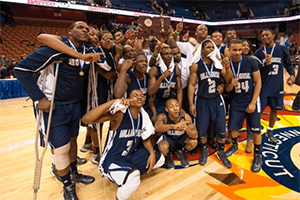 UNCASVILLE - The Hillhouse of New Haven boys' basketball team had already beaten Fairfield Prep twice prior to Saturday's CIAC Class LL final. The third time was the charm -- junior Raiquan Clark had a game-high 26 points with 12 rebounds as the No. 2 Academics beat top-seeded Fairfield Prep, 52-42, to win a state-record 22nd CIAC title at Mohegan Sun Arena. "It's hard to beat a team three times and we did it," junior Clark said. "We did a good job today." Hillhouse (26-1) was the No. 1 team in the New Haven Register Top 10 media poll prior to the state tournament and will finish with that ranking. Prep was No. 2. Chaise Daniels had 10 points and seven rebounds for Hillhouse. Bobby Bynum Jr. added six points, five rebounds and five steals. Paschal Chukwu had 12 points, 16 rebounds and six blocks for the Jesuits (24-3) while Tim Butaia added 14 points and nine rebounds. The two Southern Connecticut Conference teams split their regular season meetings. Hillhouse beat Prep in overtime to win the conference title, 53-47. "We played four games, they won three of them," Jesuits coach Leo Redgate said. "If we played 10, would we only win one or two? No. I think (Hillhouse) coach (Renard Sutton) would (agree with) that." Hillhouse scored the first five points in Saturday's game and never trailed thanks to its speed and suffocating defense. It led by as much as 13 points (40-27) with seconds left in the third quarter. Prep shot 29.8-percent and turned it over 17 times. "Their perimeter defense is the best we've seen," Redgate said "I think it's the best in the state They deserved to win. I think that's it -- their perimeter defense took us out of stuff, and we didn't get any good looks outside." Clark said, "It is hard work (defense). ... If you play defense, you're going to get turnovers and basically win the game." Points in the paint-HILLHOUS 34,FAIRPREP 24. Points off turnovers-HILLHOUS 8,FAIRPREP 11. 2nd chance points-HILLHOUS 21,FAIRPREP 15. Fast break points-HILLHOUS 6,FAIRPREP 2. Bench points-HILLHOUS 28,FAIRPREP 3. Score tied-0 times. Lead changed-0 times. Last FG-HILLHOUS 4th-03:35, FAIRPREP 4th-00:39. Largest lead-HILLHOUS by 13 3rd-00:26, FAIRPREP None. Technical fouls: Hillhouse-None. Fairfield Prep-None. BLOCK by Thomas Nolan 06:19 MISSED JUMPER by Bobby Bynum Jr.
BLOCK by Paschal Chukwu 05:16 MISSED LAYUP by Christopher Leak Jr. MISSED LAYUP by Paschal Chukwu 05:08 REBOUND (DEF) by Bobby Bynum Jr. REBOUND (DEF) by Tim Butala 04:14 MISSED 3 PTR by Bobby Bynum Jr.
03:50 STEAL by Christopher Leak Jr.
BLOCK by Paschal Chukwu 03:32 MISSED LAYUP by Bobby Bynum Jr.
03:31 SUB OUT: Christopher Leak Jr.
SUB OUT: Keith Pettway 08:00 SUB OUT: Christopher Leak Jr.
07:53 STEAL by Bobby Bynum Jr.
07:39 STEAL by Bobby Bynum Jr.
FOUL by Thomas Nolan (P1T2) 07:36 MISSED FT SHOT by Bobby Bynum Jr. REBOUND (DEF) by David Zielinski 07:36 MISSED FT SHOT by Bobby Bynum Jr. MISSED JUMPER by Paschal Chukwu 05:23 REBOUND (DEF) by Bobby Bynum Jr.
05:01 SUB IN : Christopher Leak Jr.
04:38 9-19 V 10 GOOD! JUMPER by Bobby Bynum Jr.
03:46 SUB OUT: Christopher Leak Jr.
SUB OUT: David Zielinski 02:02 SUB OUT: Bobby Bynum Jr.
00:54 SUB IN : Bobby Bynum Jr.
07:13 REBOUND (OFF) by Bobby Bynum Jr.
06:07 SUB OUT: Christopher Leak Jr.
TURNOVR by Tim Butala 05:22 STEAL by Bobby Bynum Jr.
05:02 REBOUND (DEF) by Bobby Bynum Jr.
04:32 STEAL by Bobby Bynum Jr.
04:29 MISSED LAYUP by Bobby Bynum Jr. MISSED 3 PTR by Thomas Nolan 01:03 REBOUND (DEF) by Bobby Bynum Jr.
06:53 SUB OUT: Christopher Leak Jr.
FOUL by Tim Butala (P2T7) 04:13 MISSED FT SHOT by Bobby Bynum Jr.
FOUL by Thomas Nolan (P4T8) 03:44 MISSED FT SHOT by Bobby Bynum Jr.
FOUL by Tim Butala (P3T10) 02:37 MISSED FT SHOT by Bobby Bynum Jr. REBOUND (DEF) by (TEAM) 02:37 MISSED FT SHOT by Bobby Bynum Jr.
02:37 SUB IN : Christopher Leak Jr.
SUB OUT: Thomas Nolan 02:21 SUB OUT: Christopher Leak Jr.
FOUL by Ryan Foley (P1T11) 02:19 36-47 V 11 GOOD! FT SHOT by Bobby Bynum Jr.
02:19 36-48 V 12 GOOD! FT SHOT by Bobby Bynum Jr.
00:17 STEAL by Bobby Bynum Jr.
00:13 TURNOVR by Bobby Bynum Jr.
00:11 SUB OUT: Bobby Bynum Jr.